Rich, dark, decadent, chocolate, leather, and an ungodly amount of smoke - a delineation most suitable for one cigar in particular: the Undercrown. It's a cigar of royal proportions, with an iconic look, taste, and smoke. One that any cigar aficionado or enthusiast has certainly had their fair share of. What could possibly make such a cigar even better? We believe we've found the answer, with the collaboration of none other than Cigar Dojo! Introducing the exclusive Undercrown 'Dogma', a term that describes a belief or set of beliefs that is accepted by the members of a group without being questioned or doubted. Cigar Dojo's dogma? Never Smoke Alone. 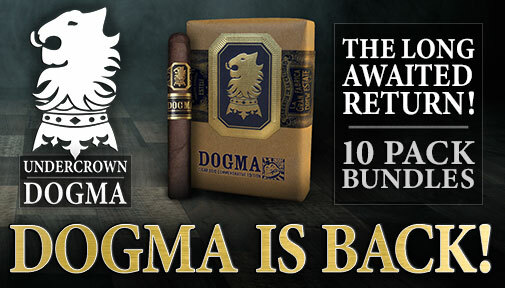 The Undercrown Dogma is the first of its kind, featuring a hearty 6 x 56 box pressed vitola! Re-shaped, re-banded, and re-blended, the Dogma features added ligero leafs, which make for a stronger, more full-bodied version of this classic fan favorite. Not only does the new box-pressed shape look and feel great, but has actually helped marry the tobaccos together, giving added flavor nuances and even increasing the cigar's draw. The Dogma exudes rich flavors of chocolate, creamy coffee, and a sweet, vanilla finish.